One third of the world's population is affected by water shortage. The water issue has gained crucial importance in the U.S., which is no longer alien to the global water crisis. According to the U.S. Environmental Protection Agency (EPA), "nearly every region of the country has experienced water shortages". 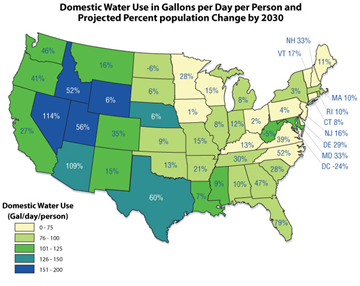 The institution expects that in 2013, at least 36 states will experience water shortages at the local, regional, or statewide levels. Innovative product and process solutions are necessary to counter the pressure coming from various sources, such as population increase, unfavorable weather conditions, growing consumption, and outdated water infrastructure. R&D activities aimed at making better use of water resources can trigger significant Federal Tax Credits. Southwestern states, such as California, New Mexico, and Texas are already facing water shortages. Low water levels in the Colorado River, which supplies for most of the consumption in Arizona, California, Colorado, New Mexico, Nevada, Utah, and Wyoming, have created international disputes with Mexico. Nationally, Texas and New Mexico are facing a lawsuit triggered by disputes over the Rio Grande. Lake Mead and Lake Powell, important reservoirs, are often bellow 50% capacity. Scarcity is not confined to the Southwest. Regions reliant on groundwater supply have seen consumption rise at a pace that natural replenishment cannot follow, a situation worsened by the growing levels of unusable water in the aquifers due to pollution. This issue has affected not only Southwestern states, but Atlantic Coastal and Gulf Coast states as well. The first cause of water shortages is the most obvious one: the weather. Critically dry conditions have hurt a significant share of the country, particularly in the West. Unfortunately, predictions for the future are not optimistic. The intensification of climate change is expected to raise temperatures and make dry spells last longer. According to recently published research in the Environmental Science and Technology, "by 2050, one third of U.S. counties are expected to face "high" or "extreme" risk of water shortage". This adverse scenario is continuously aggravated by increasing consumption. The growing U.S. population imposes a great deal of pressure over water resources and raises consumption to unsustainable levels. Data from the EPA estimates that a family of four uses up to 400 gallons of water a day , a number that increases in drier locations. The situation is evermore problematic due to waste and excess. Water supply is also restrained by the inadequacy of aging water treatment and delivery systems. Studies show that 30% of the pipes in drinking water systems that serve over 100,000 people are between 40 and 80 years old, while another 10% is older than 80 years. Water shortage constitutes a costly problem. In the summer of 2011 alone, its impact on the Texas economy was estimated between $3 and $5 billion . Several economic activities are threatened by insufficient water supply, particularly the agricultural sector. The negative impact over crops is bound to cause unemployment and increased consumer prices. With regard to water prices, some foresee the increasing of the cost of water as a means to encourage savings. Following this logic, consumers would have to pay for the "real price of water", which accounts for its decreasing availability. This is particularly worrisome since in the last years, water has taken a growing share of disposable income in American households. A survey of 100 municipalities found that domestic water bills have at least doubled in 25% of municipalities in the last 12 years, due to upgrades in water infrastructure, compliance to water management mandates, and security safeguards . Another result of decreasing water availability is the increase of litigation over water resources at the local, state, and international levels. A more positive result of the water crisis is the cultural shift it is triggering. Water is a valuable resource and conservation is increasingly considered a priority. An example is the imposition of watering restrictions by local governments. The decreasing availability of water has also fostered the development of innovative solutions for efficiency that aim at reducing wastage. In the U.S., households consume more than 50% of publicly supplied water, making water efficient designs a fundamental response to the imminent water crisis. R&D activities for the creation of new and improved water-saving designs have gained significant importance, particularly when it comes to greywater reuse, smart irrigation, and rainwater harvesting. Different from black water (or sewage) which contains human waste, greywater is wastewater from domestic activities, such as dishwashing, laundering, bathing, or showering. This leftover water can be recycled on-site and used for activities such as irrigation, flushing toilets, and heat reclamation. Even though the concept of recycling greywater is not a new one, challenges remain, particularly in the development of efficient and cost-effective systems suitable for widespread deployment. Recent developments and ongoing research, however, are very promising and demonstrate the countless possibilities within this field. In the case of toilets, the potential for savings is huge as they account for more than 30% of an average household's water use. Existing greywater toilet systems take too much space to accommodate water storage recipients and other equipment. Innovative designs, such as Roca's W+W, a combined toilet and washbasin, have managed to optimize space but still lack affordability. R&D activities aimed at combining both of these features are essential to the use of this water-efficient technology. Greywater heat recovery is the process of capturing heat from used hot water (from showering and dishwashing, for instance) and using it to pre-warm incoming cold water. An average of 60% of the heat can be recovered, which results in important savings of energy and time. This technique can be used for both water and space heating purposes. Heating systems can use this wastewater to pre-warm water or other heat transfer fluid, which is then brought up to the necessary temperature by conventional means. Most current commercially available systems are storage ones, which not only take a lot of space but are highly complex to install. Non-storage systems, although easier to install, are not as efficient since they are only appropriate for use with showers, not reusing wastewater from other sources such as dishwashers or washing machines. R&D efforts are currently underway and focus on making greywater heat recovery systems more efficient, easier to install, and less space consuming. The goal of creating more efficient irrigation techniques has also inspired significant R&D activities. According to the EPA, potential savings are vast; "we could save $435 million in water costs and 120 billion gallons of water across the country annually from not overwatering lawns and landscapes". Notable initiatives include the research on how to use Big Data to improve irrigation practices. A recent report on "Agricultural Preparedness and the Agriculture Research Enterprise" from President Obama's Council of Advisors on Science and Technology underlined the abundance of agricultural data to be considered: "from soil moisture and chemistry, meteorology and market conditions, crop and market conditions, consumer nutrition and preference, to gene sequences and ecological variables". The report proceeds to highlight existing challenges such as accessibility, interoperability, persistence, and the need for research efforts that open the way for "better data-management strategies addressing such issues as data storage, search algorithms, analytical methods, data sharing, and data visualization". Rainwater catchment and reuse systems also constitute a very promising field. Recent R&D activities have focused on diversifying the possible applications of rainwater. An outstanding example is the partnership between AKRF, an Environmental Planning & Engineering Consulting Firm, and Newman & Co., a family owned paper-recycling company from Philadelphia, PA.
After 90 years of business, Newman & Co. decided to innovate and use rainwater to produce paper. The project is currently in its second phase of implementation and initial results have been extremely successful. Since September 2012, the company has manufactured thousands of tons of paperboard using harvested rainwater. The success obtained in the first phase was such that the project was awarded a Storm Water Management Grant by the Philadelphia Water Department (PWD) and the Philadelphia Industrial Development Corporation (PIDC), which will cover most of the Phase II expenses. Understanding the role of environmental buffers in surface water indirect potable reuse projects. Effectiveness of treatment wetlands in improving reclaimed water quality. Understanding the effectiveness of nutrient removal processes in reduction of constituents of concern relative to indirect potable reuse. Understanding the potential for utilizing nanofiltration as a beneficial treatment process relative to reclaimed water. In a world where 97% of water is seawater, desalination stands out as a necessary alternative. However, current techniques to remove salt and minerals from seawater remain controversial, particularly due to high system costs, excessive energy intake, and negative environmental impacts. Major companies and research centers have engaged in R&D activities to overcome these challenges. Recent advancements include the development of Memstill, a new desalination technology based on membrane distillation. Different from other membrane technologies, such as reverse osmosis, this emerging technique uses the difference in vapor pressure of water across the membrane, and not the total pressure, as the driving force for desalination, significantly reducing energy requirements. Memstill is currently being tested and its creators expect it to effectuate lower operational costs than currently available technologies. The Carlsbad Desalination Plant, in California, will soon be the largest plant of such kind in the Western Hemisphere. Although the project remains controversial, investors believe that the use of cheaper and more durable filters will bring down operation costs and that the $1 billion plant will make desalination a definite item on the country's menu of water sources . Water shortages are already a reality in the U.S. and predictions point to an even drier future. In this scenario, the development of innovative water efficient product designs and viable water treatment techniques is crucial. Federal R&D Tax Credits are available to support companies engaging in this quest.